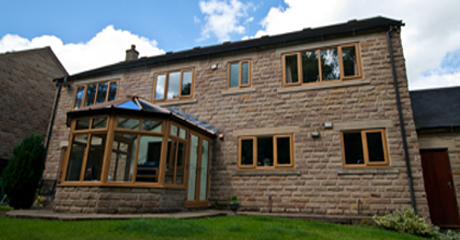 Take a look at some of our recent work and installations. 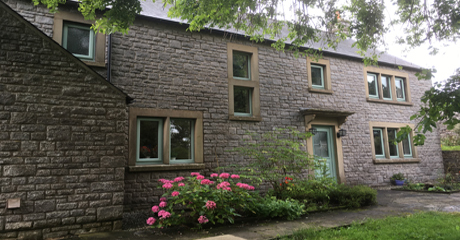 The homeowners approached PeakGlaze Ltd to replace their existing timber windows with a modern PVCu alternative that would offer them greater energy efficiency and durability whilst enhancing the character of the property. 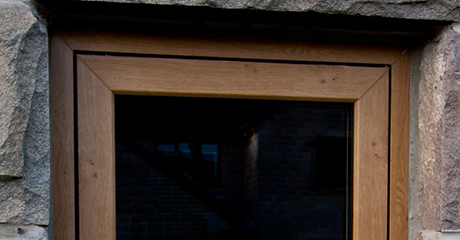 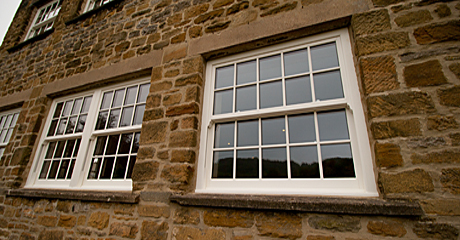 They chose heritage flush sash windows in Irish oak wood grain effect which is designed to replicate the traditional look. 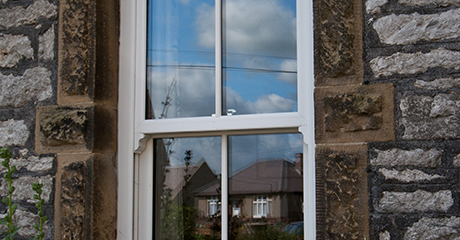 All window are double glazed to Energy Rating A. 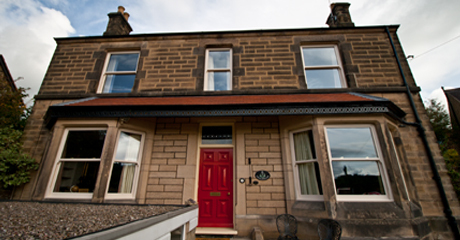 This property had traditional single glazed timber box sash windows which were drafty and high maintenance. 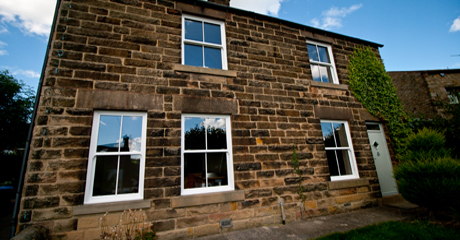 The homeowner chose the Genesis PVCu timber alternative sliding sash window which boasts aesthetic features such as run through sash horns, milled cottage bars and a deep bottom rail to replicate the appearance of a Victorian sash window. 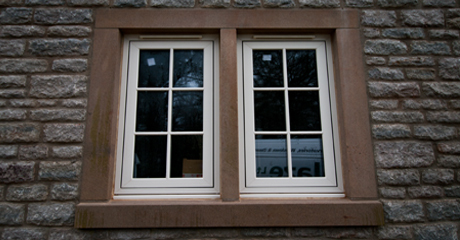 All the windows are double glazed with an Energy Rating A. 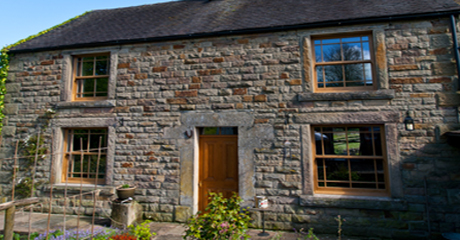 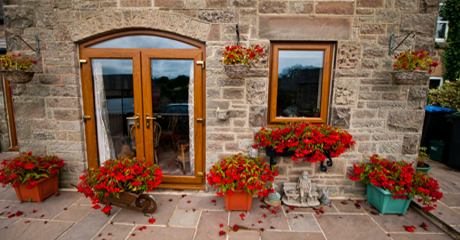 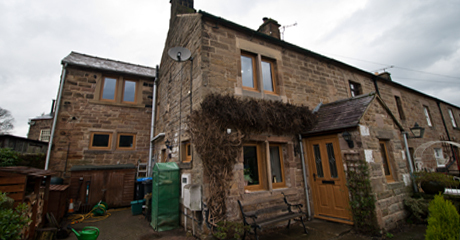 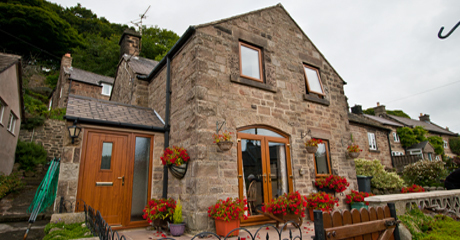 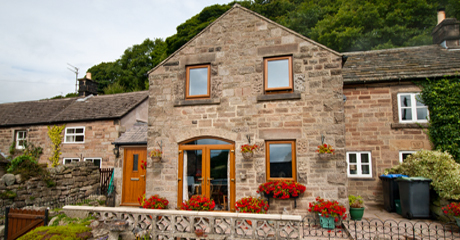 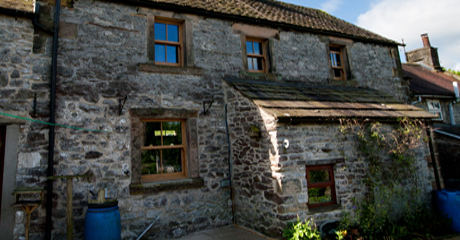 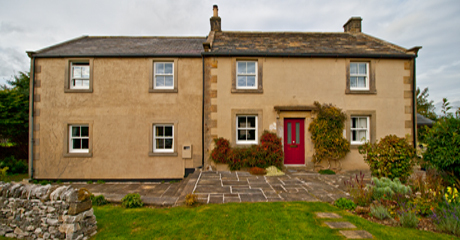 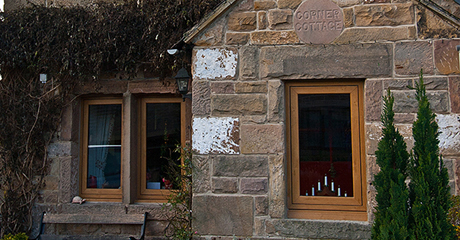 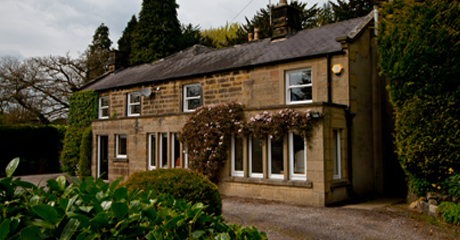 Flush sash windows in cream foiled effect were fitted at this new build property in the middle of the Peak District. 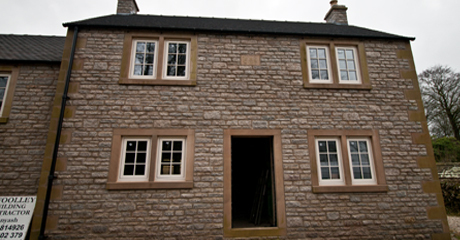 The planning permission stipulated that the windows needed to be in-keeping with the area and resemble traditional timber frames in appearance. 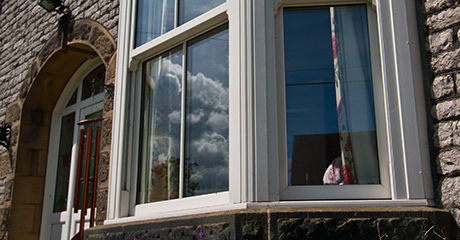 All flush windows come with A-Rated glass as standard. 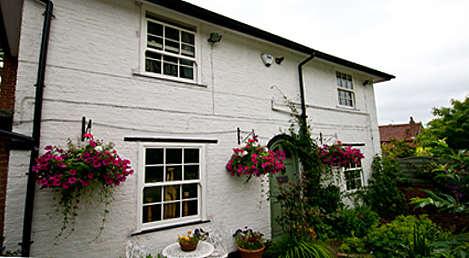 Our client wanted new windows that were low maintenance and draft proof. 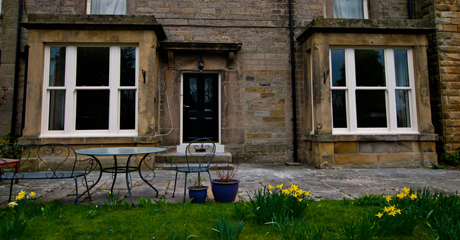 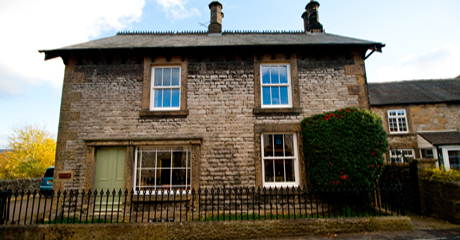 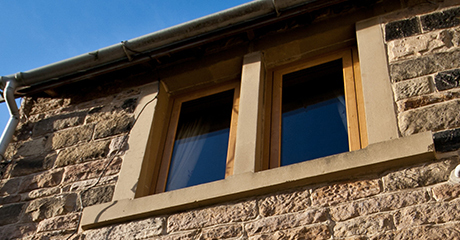 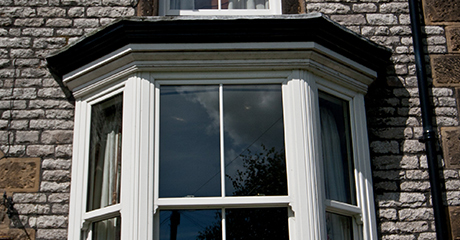 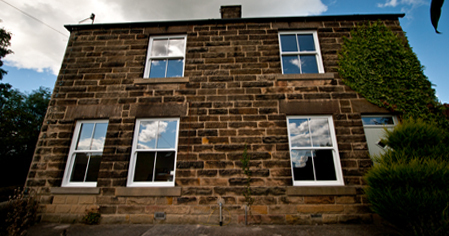 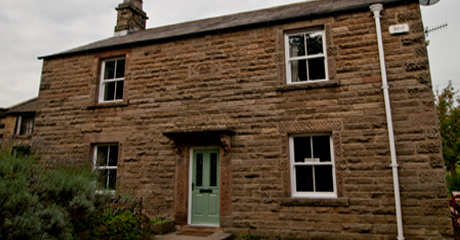 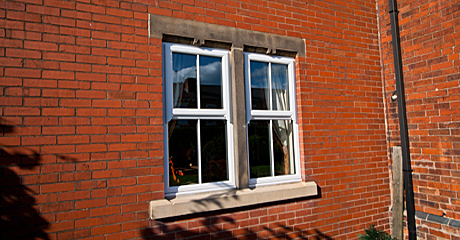 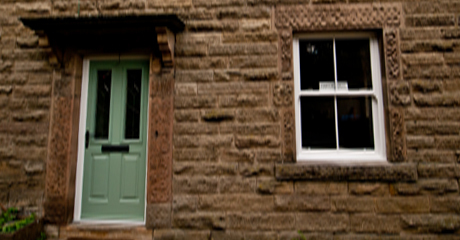 The original timber box sash windows were replaced with energy efficient PVCu from the PeakGlaze Heritage Range. 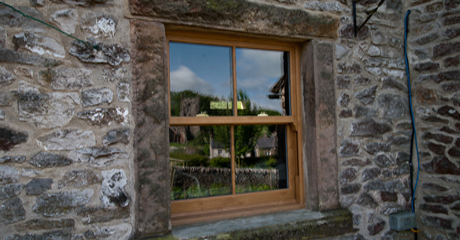 For this property PeakGlaze fitted standard casement windows in Irish oak effect with a chamfered finish throughout. 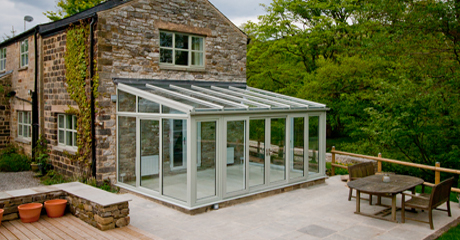 For the conservatory the homeowner chose self cleaning roof glass which offers benefits such as 80% heat reflection, glare reduction and has a pleasing sky blue visual tint. 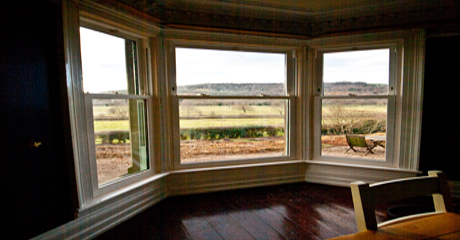 A handsome restoration of two square bay windows in a heritage property. 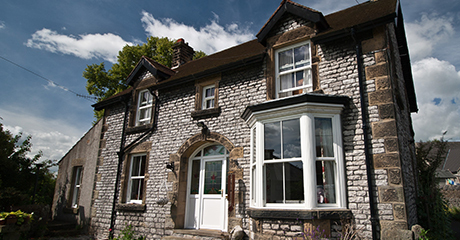 PeakGlaze removed the existing single glazed timber box sash windows and replaced with the Genesis VS vertical sliding sash window system which incorpated A-Rated double glazing and authentic features. 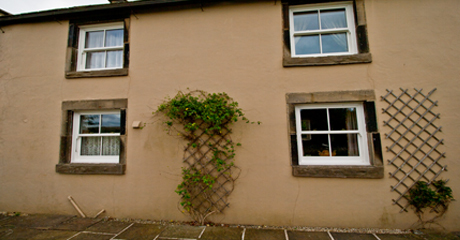 The customer chose to have cream grain effect on the external face with a flat white interior. 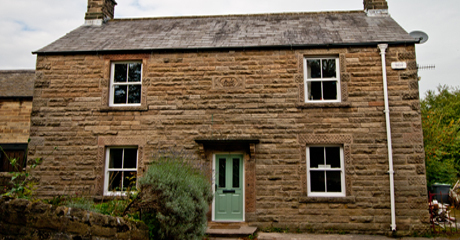 At the start of 2017 PeakGlaze Ltd was entrusted to replace the windows, door and porch on this stunning heritage property in Derbyshire. 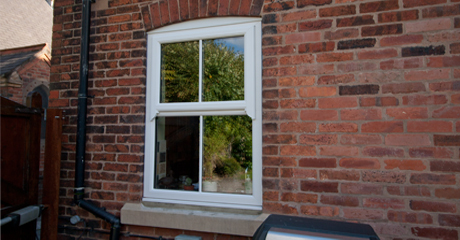 A combination of casement and sliding sash windows were fitted in white PVCu and complimented by a solid timber composite door. 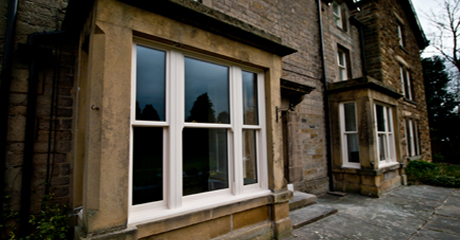 PeakGlaze have extensive experience replacing old timber box sash windows with modern day alternatives and can specify the windows to the clients needs. 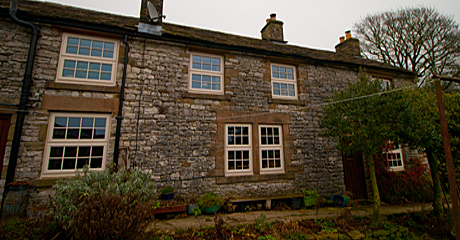 These are A-Rated PVCu sliding sash windows in Irish oak grain effect with cottage bars that are in an identical configuration to the ones that were removed. 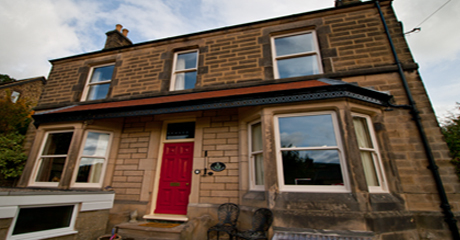 A quintessential Victorian terrace property that had been spoilt by poor PVCu windows installed 20 years ago. 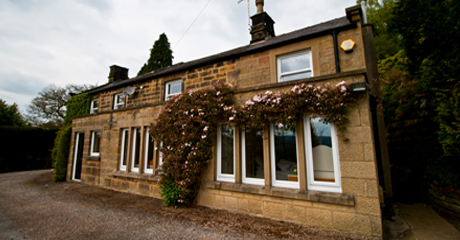 PeakGlaze fitted sympathetically designed PVCu sliding sash windows in a white grained effect to restore the property to its former glory. 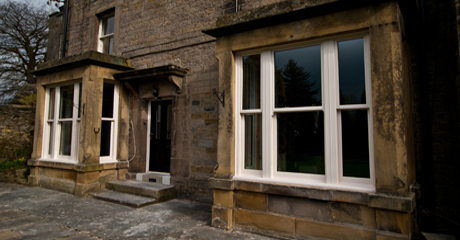 Stunning Genesis vertical sliding sash windows fitted throughout this unique Georgian property to restore some period splendour. 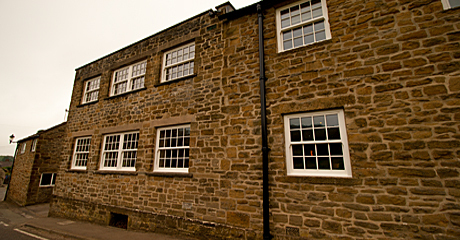 On this project the original timber sliding sash windows were replaced throughout with Genesis VS sliding sash PVCu windows in cream grain effect. 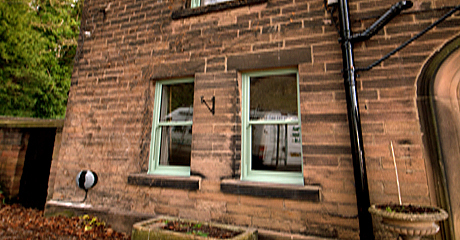 The original timber sliding sash windows on this early 19th century property were removed and replaced with new PVCu vertical sliding sash windows in Chartwell green grain effect with a white grain internal face. 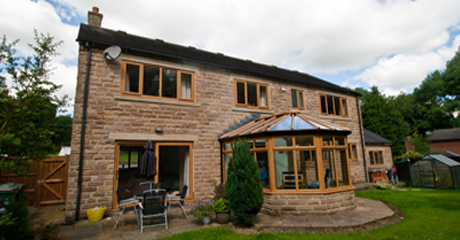 All joinery work, including timber timber achitraving completed by PeakGlaze joiners. 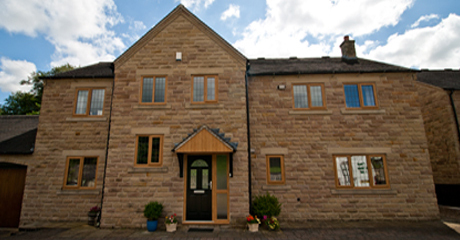 Golden oak casement windows and doors with A-Rated sealed units. 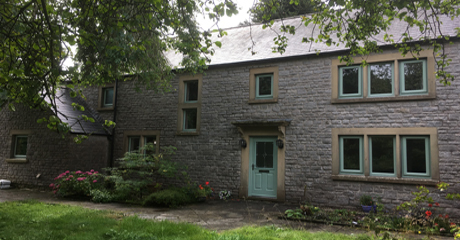 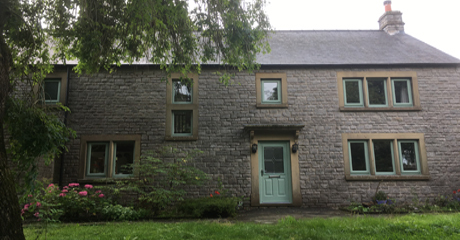 Chartwell green casement windows and composite door fitted at this traditional limestone property in Taddington, Derbyshire. 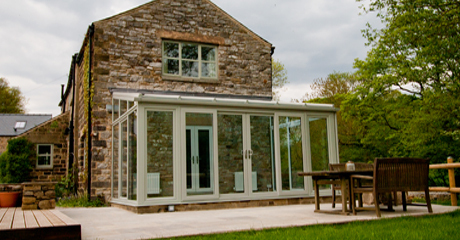 Lean-to conservatory in Agate grey PVCu with intergrated patio doors and solar reflective roof glass. 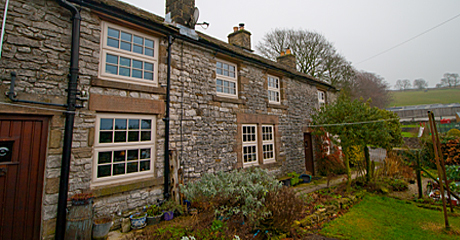 For this project our customer wanted to replace existing timber sash windows with new PVCu equivalant and chose PeakGlaze to install Genesis VS sash windows. 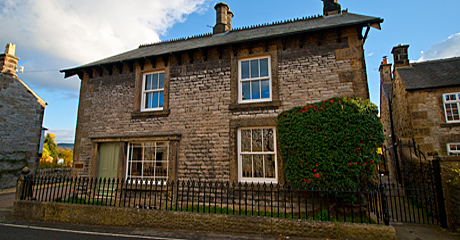 Planning permission was granted by Peak District National Park planning authority. 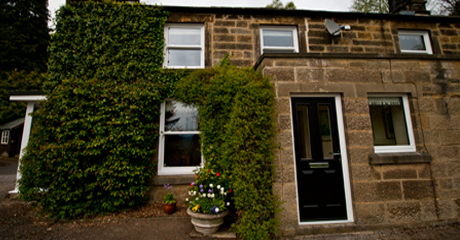 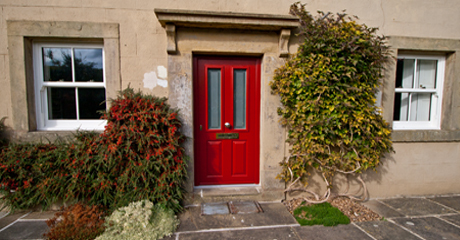 To compliment the property even further the homewoner chose to have an Endurance timber core composite door. 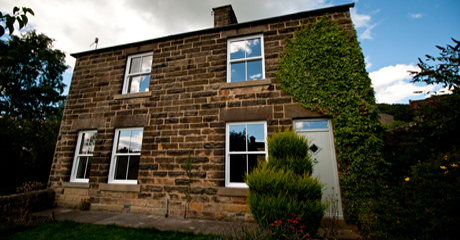 Two storey flat block renovation fitted with Genesis sliding sash windows to replace existing timber windows which had become rotten. 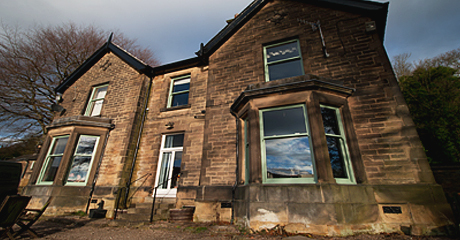 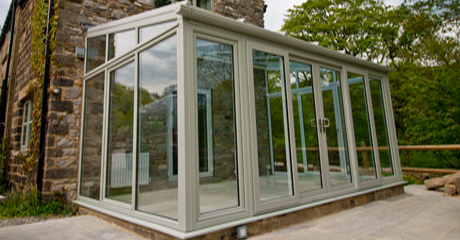 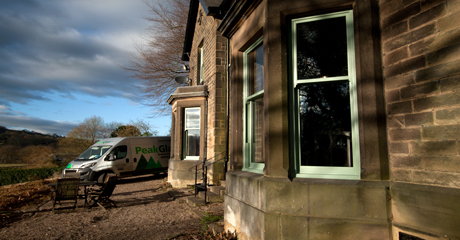 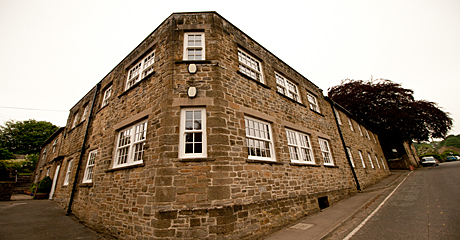 Prior to installation PeakGlaze obtained full planning permission from Peak District National Park as the building was located in a conservation area. 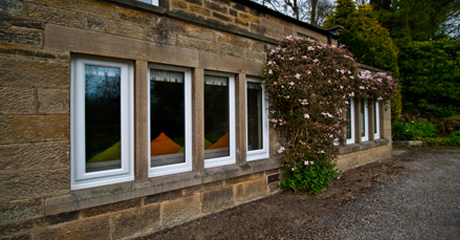 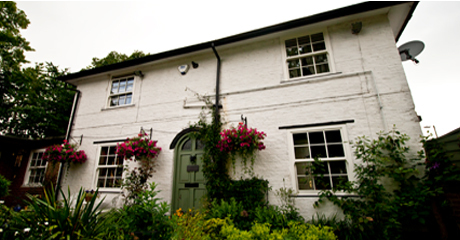 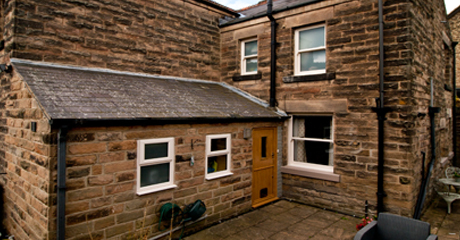 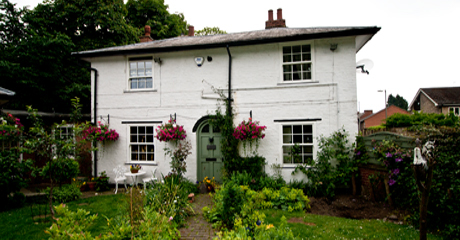 PeakGlaze were commisioned to replace all windows throughout this 19th century property situated in a conservation area. 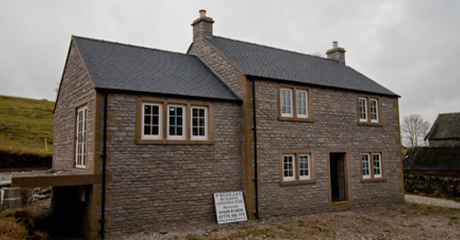 With local authority planning permission our client chose to have Genesis vertical sliding sash windows that were to be manufactured in the same design as the existing windows. 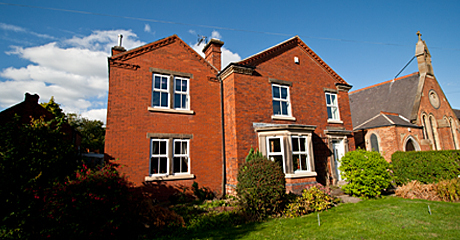 To enhance the character of this red brick property the homeowner chose to have mock sash casement windows fitted throughout. 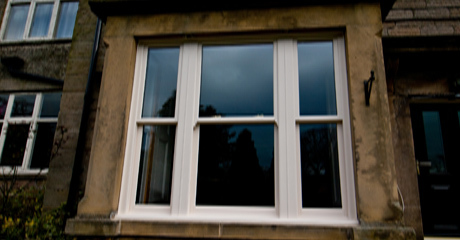 All windows were double glazed with A-Rated argon filled sealed units. 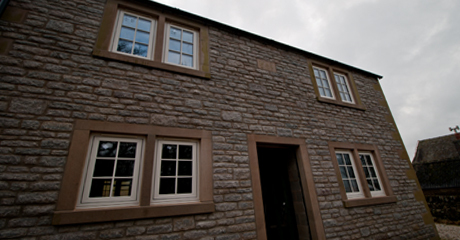 Cream grain effect mock sash windows fitted into character limestone property.